Although largely passed over by art historians until the 1970s, women artists have played a significant role in the art world since ancient times. Ask your students to create a work of art that expresses a female perspective. Ask them to address gender issues in a work of art, and if that is relevant in today’s pluralistic society. What biases, if any, do we bring to a work of art based on our gender? Palmer is considered one of the most important American graphic artists of the nineteenth century. She turned out over 200 farm scenes and landscapes for Currier and Ives, and a good deal more that went out anonymously for the firm. 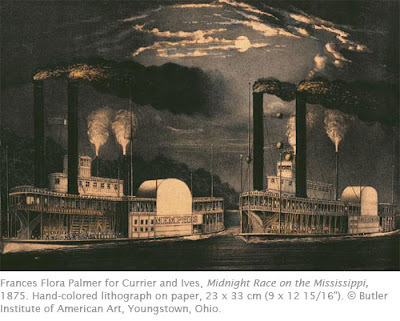 Currier and Ives prints were the alternative to buying fine art for the middle class, and the American public purchased Palmer’s work in great quantities. Few other artists at the time expressed so clearly the optimistic and romantic spirit of the new country. Palmer received an excellent education in her native London, which included art lessons. This enabled her to work as a lithographic artist when she and her husband immigrated to the US in the 1840s. She and her husband founded a lithographic company in 1845, but it failed. By 1849 she was creating lithographs for Nathaniel Currier, soon of Currier and Ives. Palmer specialized in landscapes. Figure drawing was her weakest skill, and other artists in the company sometimes assisted her on this. She often rode out to the countryside in Long Island to sketch the scenery on site. Palmer lived in Brooklyn all her years in America. She never went farther west than Hoboken, New Jersey, but produced numerous views of the western American territories including views of the Rocky Mountains she had seen in other artists’ studies. Although most of the artists who produced designs for Currier and Ives were men, most of the artists who worked in the New York studio were women. They meticulously watercolored thousands of lithographs that were then sold for as cheap as 10 cents. For a brief bio and beautiful painting by this talented artist, click here. Click here for more information about Currier and Ives. The “Education and Outreach” section contains an interactive feature for students. Connections Across Curriculum - From agricultural beginnings to the Industrial Revolution, Currier and Ives prints reaffirmed the national identity that was taking shape in the United States. Images of daily life were popular, as well as current events that gave Americans a sense of pride in their country. How do Palmer’s contributions help shape our view of 19th century America? How do Americans display their national identity today?